At the reception you will find information of all tourism in the area, also we offer WIFI service. 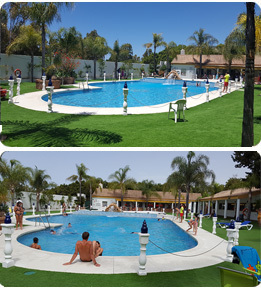 Enjoy two magnificent swimming pools (adult and children) in the company of family. A perfect complement to the beach on the hottest days of the year when a bath makes you feel better. Recreation areas including swimming pools for adults and children, multi-track, table tennis, playground, "Plaza Mayor", where you can enjoy a wonderful picnic, etc. In our glass paddle tennis court, our customers can enjoy good games and championships organized by the Camping. In our new station RV may evacuate gray water of their vehicles and supply them with water. We also have car wash pressure. 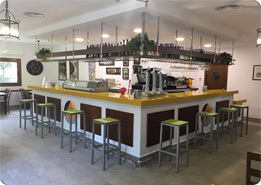 In our restaurant we have a varied menu to be our specialty paellas, grilled meats and our homemade dishes. 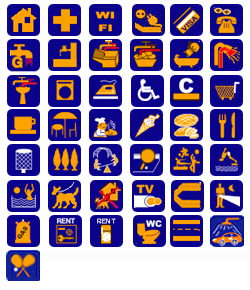 Our facilities of top quality and fully accessible for people with disabilities, baby bath, have also laundry area. In the supermarket you can find food products as well as camping and bath items.